John Exter (1910 - 2006) was an esteemed American economist. A former member of the Board of Governors for the Federal Reserve, founder of the Central Bank of Sri Lanka, and head of the NY Fed during the failed London Gold Pool. Today John Exter is now mostly known for creating Exter's Pyramid, which he designed and used about 50 years ago. Further along in this article we will diplay both his original and now updated illustrations of asset classes in terms of their overall risk of default (potential for bankruptcy) and overall estimated notional values then and today in 2018. Exter's early adulthood spanned the 1930s Great Depression. 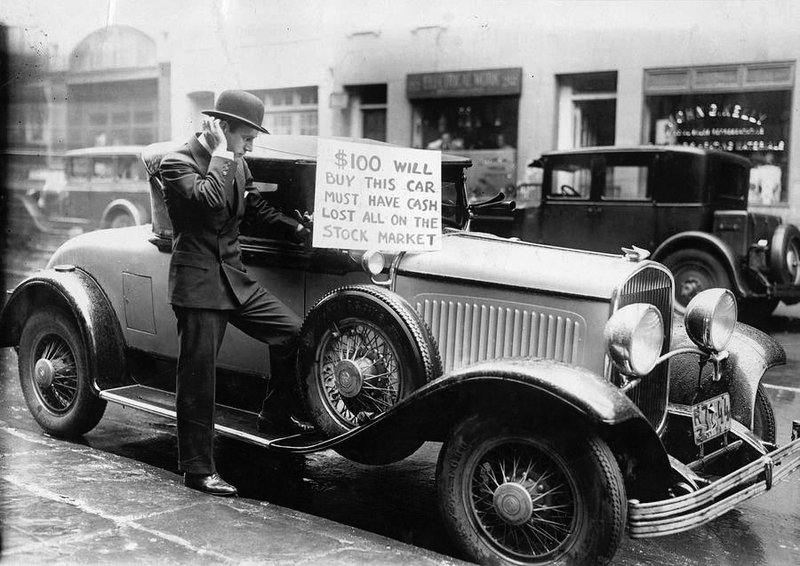 A young John Exter saw his Chicago bond trading father lose everything when the US stock market crashed in late 1929. 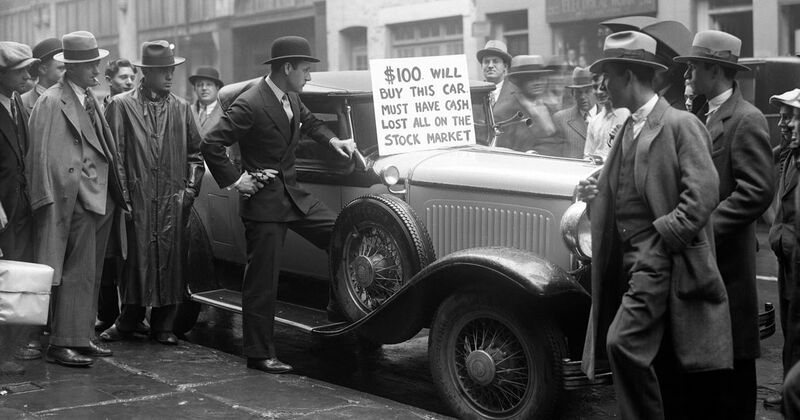 This shocking incident spurred his interest to study and better understand what factors were responsible for the Great Depression of the 1930s. After graduating from the College of Wooster (1928-1932) John Exter went on to study at the Fletcher School of Law and Diplomacy and in 1939, to Harvard for graduate work in economics. After a stint at MIT during World War II, Mr. Exter began work on the Board of Governors of the Federal Reserve System as an economist. In 1948 he first served as adviser to the Secretary of Finance of the Philippines, and then as the Minister of Finance of Ceylon (now Sri Lanka) to develop its central bank. He eventually became the first governor of the newly organised Central Bank of Sri Lanka in 1950. In 1954 the Federal Reserve Bank of New York appointed John Exter as vice president in charge of international banking and gold and silver operations. 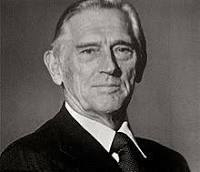 While speaking at the Detroit Economic Club in 1980, Mr. Exter stated that when he took charge of gold and silver operations at the New York Fed in 1954, US gold reserves were valued at $24 USD billion (gold was valued then at a fixed price of $35 USD oz). 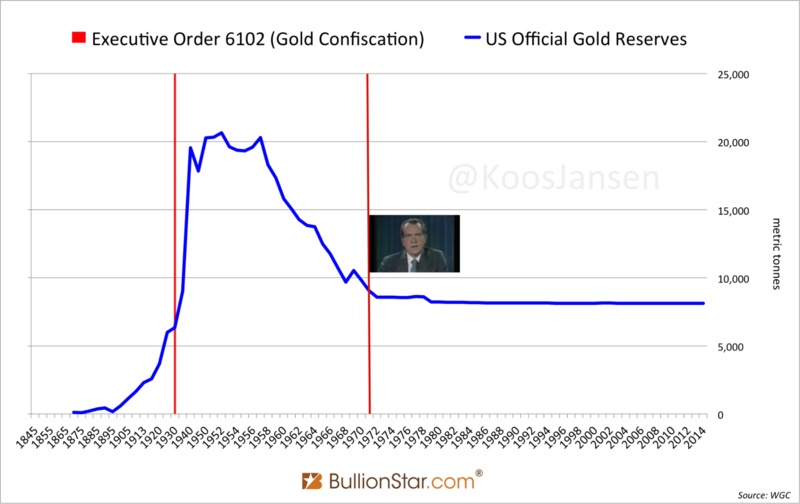 A collusive attempt to contain gold prices soon followed, and the USA lost a large swath of the gold reserves it took in from WWII military related exports and its citizen's gold confiscation in 1933 as a result. By 1962, as the western led London Gold Pool price suppression agreement was well underway, US gold reserves had fallen to $16 billion and by 1966 to $13.5 billion (while gold was still valued at a then fixed price of $35 USD oz). Shortly following Exter’s tenure ended at the Federal Reserve, the Bretton Woods agreement was broken and the US dollar became a fully fiat currency without gold redemption by middle August 1971. Aside from the Swiss franc at the time, all other currencies had no ties to gold either. The London Gold Pool failed to control the price of gold as France and other nations continually demanding gold over US dollars in balance of trade settlements. In Exter's original illustration above, gold bullion forms the tiny base as the most reliable asset class, while other asset classes built on higher levels are progressively more risky. The larger width of asset classes at higher levels of the inverse pyramid represent their larger total worldwide notional value at the time. 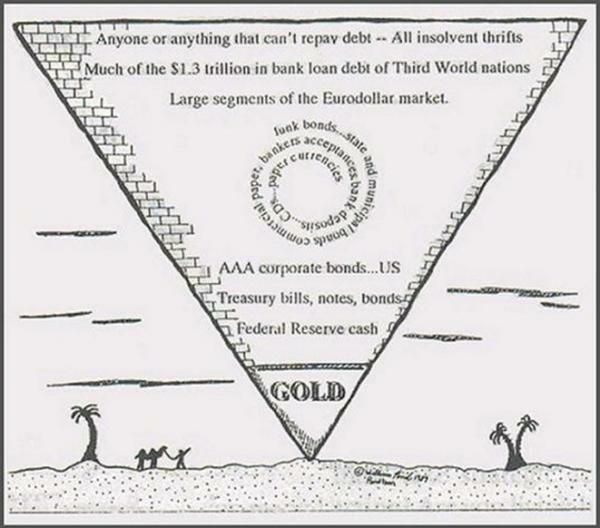 Exter's original pyramid placed Third World debt at the top. Today derivatives hold this questionable honor. Exter’s debt pyramid has been able to keep expanding as financial innovation and economic financialization has introduced ever more leverage into the global economy. The mushrooming derivatives market with its credit default swaps, collateralized debt obligations, mortgage backed securities, etc. have all taken top risky residency in this more modern inverted Exter pyramid. According to Exter's model, those derivatives with the weakest and furthest links from base money are the first to be rejected and potentially bankrupted. As confidence vanishes and a broad based liquidation process ensues, the higher risk asset class values cascade into their underlying collateral. 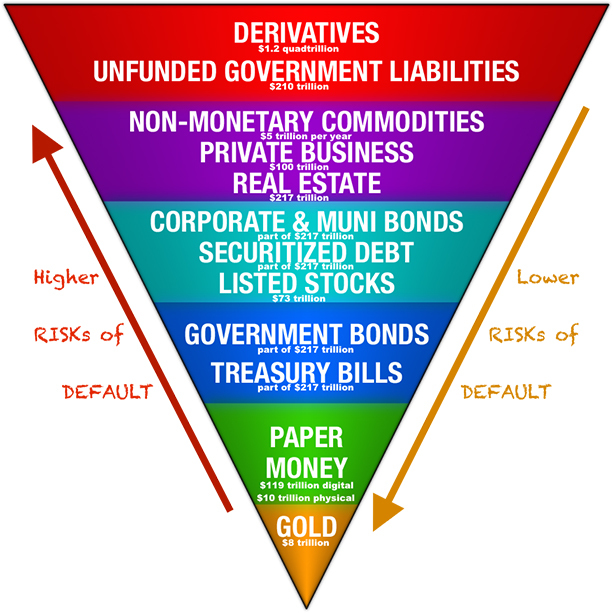 The financial spillover effects flow down the pyramid impacting even the least risky securities, and near the tip of the pyramid, paper currency itself. In most financial crisis, physical paper currencies are unlikely to default in the short term within the nation they have legal tender status in (hyperinflations the lone outlier). But unlike physical gold bullion, government fiat currencies can be created at will and devalued by mere decree. Measuring and forecasting the masses confidence in fiat currency is difficult to do accurately. Their breaking point is a known, unknown amongst central banks. What is indeed known is that throughout history and without exception, all monetary proxies stemming from physical bullion coins eventually become worthless given enough time. Gold bullion forms the smallest and soundest base in the inverted pyramid diplaying highest to lowest risk asset classes. This is because physical gold bullion is universally the most recognized default proof asset an investor can own. It is for this reason central banks own about 1 out of every 5 ounces of gold ever mined within their very own vaults. Related to gold bullion, all other physical precious metal bullion items ( silver, platinum, and palladium ) are all similarly default proof. All physical precious metal bullion items are extremely scarce by nature and do not require the performance of other parties to always maintain some measure of value in the financial market. 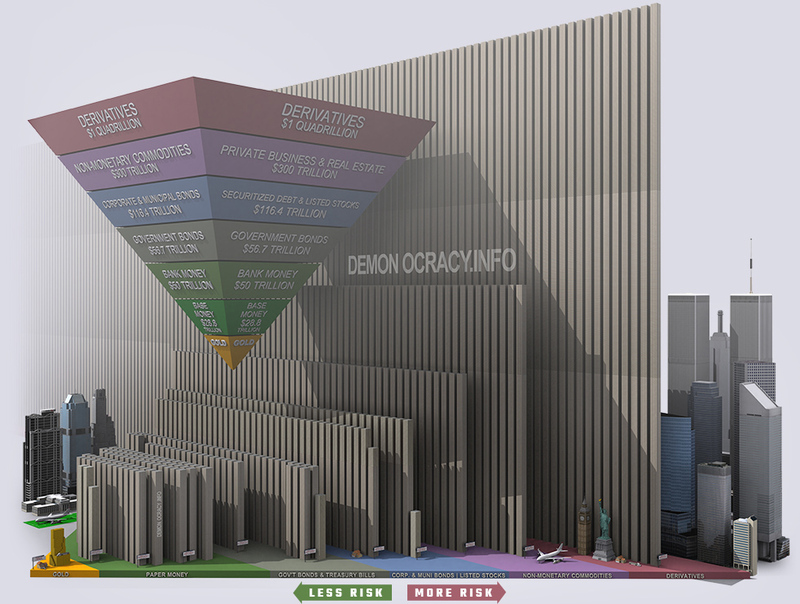 Finally above, a 3-dimensional rendering of the modern day Exter Pyramid. Those large green walls represent stacked pallets of $100 US dollar bills. 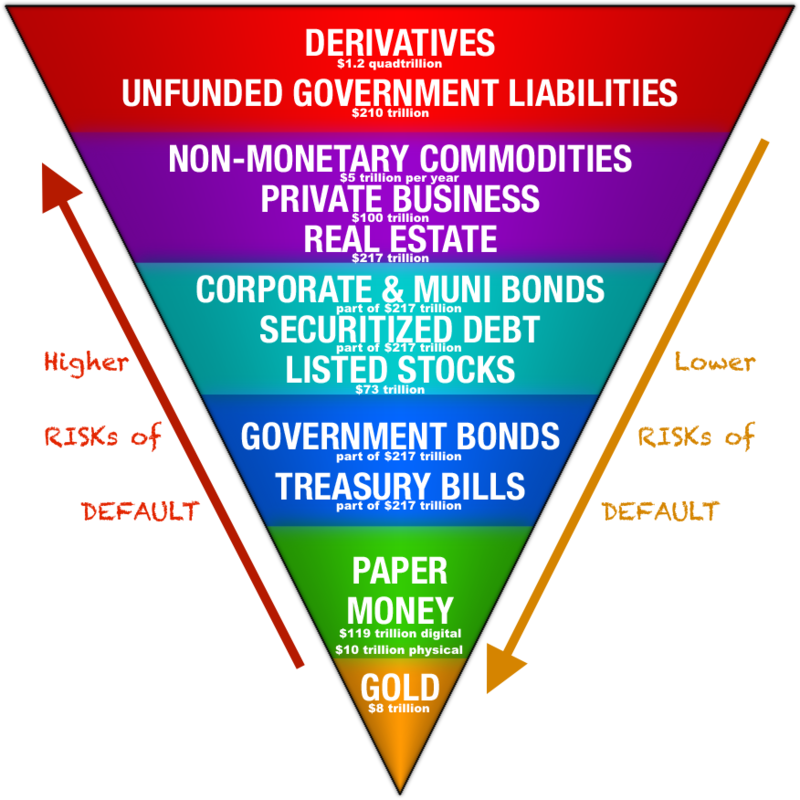 Illustrated at scale, each division of the inverted pyramid is drawn respective to the size of each asset class it respectively represents. See if you can spot landmarks like the Statue of Liberty, the old World Trade Center Towers, and an illustration of the entire world’s physical gold supply at the tip of the pyramid itself. This is why gold bullion remains the safest asset to own outright. Learn more about bullion with our free 21st Century Gold Rush guide here at SD Bullion.